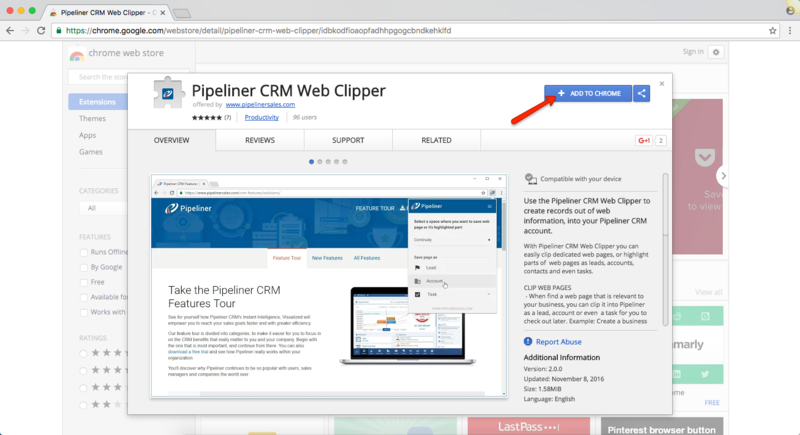 With Pipeliner CRM Google Chrome Extension and it's Web Clipper you can easily clip dedicated web pages, or highlight parts of web pages as leads, accounts, contacts and even tasks. Here’s how it works. Latest Pipeliner CRM Continuity version. 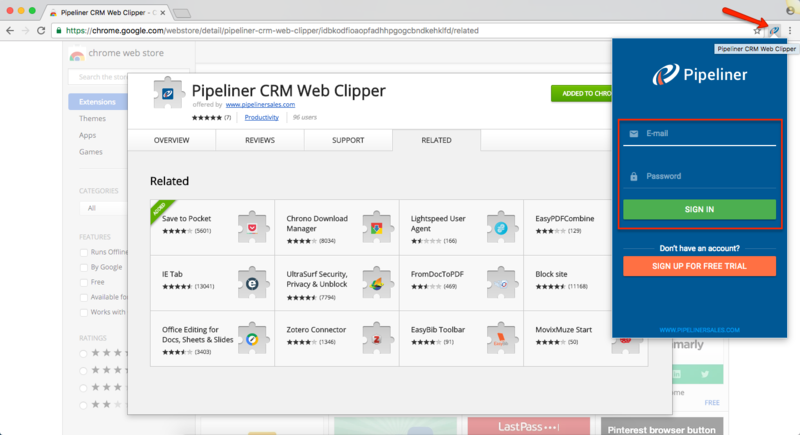 Click the “+ ADD TO CHROME ” button and add Pipeliner CRM Web Clipper to your Google Chrome Extensions. 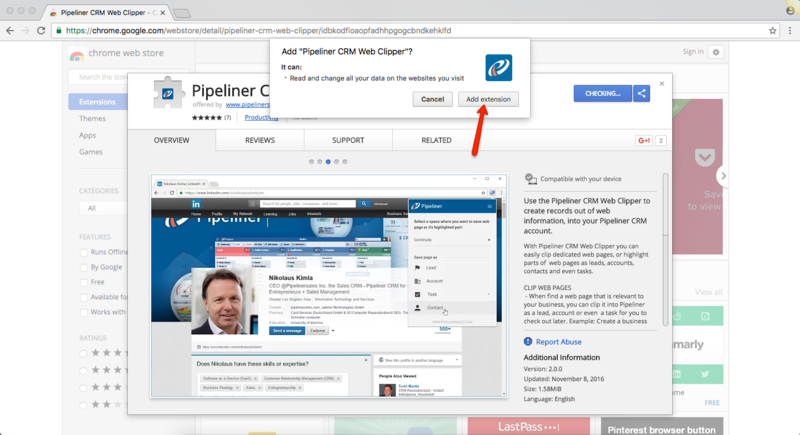 Confirm the “Pipeliner CRM Web Clipper” and add it to your Google Chrome Extensions. You should be able to see the Pipeliner CRM icon within the extension menu on the top-right part of the Google Chrome. Now, you need to sign in to your Pipeliner CRM Account. Just click the extension icon and use your Pipeliner CRM Credentials to Sign into your Pipeliner CRM Account. After successful activation of the Pipeliner CRM Web Clipper within Google Chrome, you will need to restart the browser to fully reload all your page content. Pipeliner CRM Web Clipper is a smart web page clipper that enables you to clip (create) records in Pipeliner CRM from website page content. When you find a web page that is relevant to your business, you can clip it into Pipeliner as a lead, account or even a task for you to check out later. When you browse a web page, and part of the page content is relevant to your business, just highlight it with a mouse and click Pipeliner CRM Web Clipper to save that information in Pipeliner as a lead, account, contact or even a task for you to check out later. 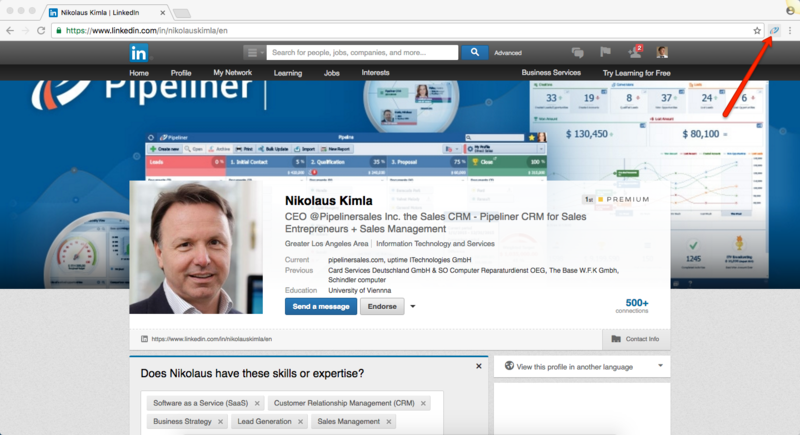 Example: Save a contact from LinkedIn as a contact in Pipeliner CRM. When clipping a new record into Pipeliner, Pipeliner CRM Web Clipper now shows you a preview screen, where you can easily review clipping data and even add more useful data to the clipped account or contact. When you browse a particular web page (LinkedIn, for example), Pipeliner CRM Web Clipper is able to recognize it, and will clip even more publicly available information for you, such as a contact’s position, email address or even a phone number. Real World Example: How Can I Clip A LinkedIn Contact to Pipeliner CRM? Go to LinkedIn and sign in to your account. Find a contact you would like to clip to Pipeliner CRM. 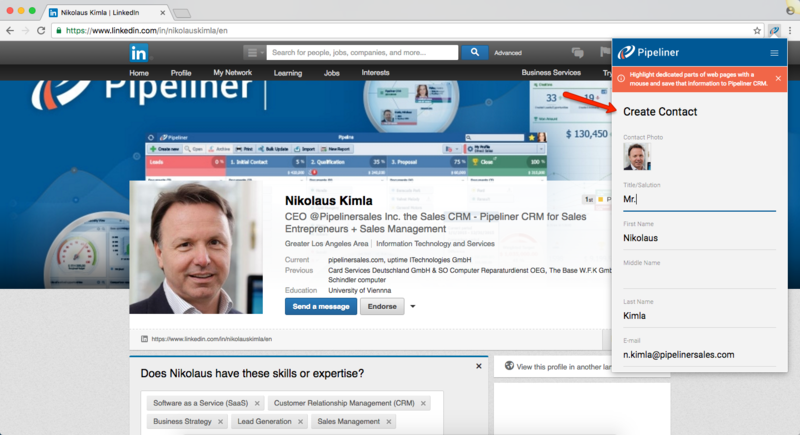 Once on the contact page, click the Pipeliner CRM Web Clipper Icon within the browser. Select the record/item you would like to create. In our case, click on the “Contact”. Pipeliner CRM Web Clipper will preview the data that you can clip to the Pipeliner CRM Address Book. Review the data and change it if needed. 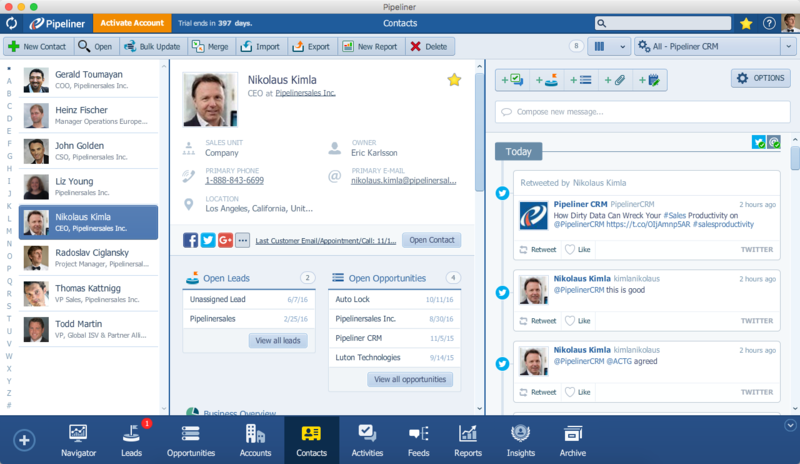 View the contact in Pipeliner CRM. With Pipeliner CRM Web Clipper you can clip any webpage content and create out of it any type of record you need. 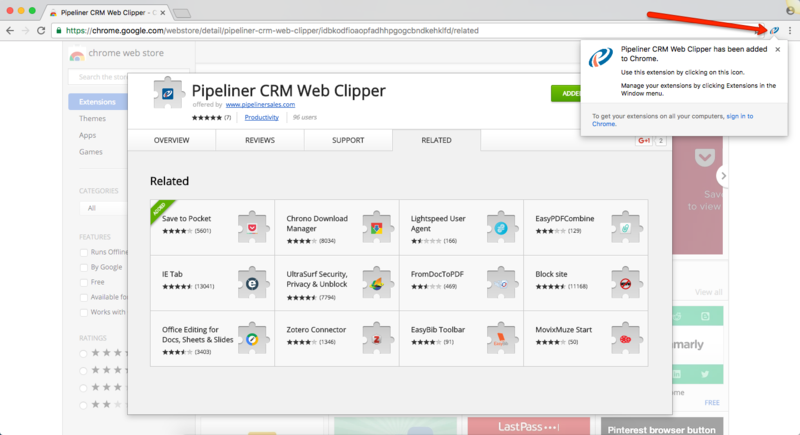 Try Pipeliner CRM Web Clipper today, and save a lot of time entering data into CRM.